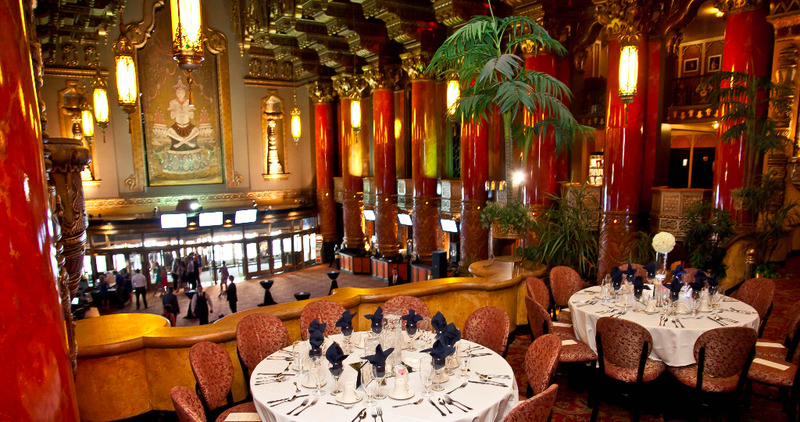 The Fox Club is the perfect place to enjoy pre-show dining in a magnificent setting. Fox Club dining atop the Grand Stairs and in the Fox Club Lounge is strictly reserved for those with Fox Club tickets. You must be a Fox Club Member and have gold tickets that say “Fox Club”. Our award-winning Chef offers seasonal selections of savory appetizers, mouth-watering entrees, Fox Club favorites and tempting desserts. Food and Beverage is not included with your tickets. For your convenience, the Fox Club accepts all major credit cards. Located on the Fox Club level overlooking Grand Boulevard. Advance reservations are recommended. We cannot guarantee accommodations for any walk-ins. With a spectacular view of the Grand Lobby, the Fox Club Bar features a full-service bar with premium brand liquor. This is the perfect place to grab a quick drink before heading to your seats. To make a reservation for those with Fox Club tickets, simply contact the Fox Club Membership office at [email protected] or 314-535-7100. Please have the Fox Club account Number (#) located on the ticket available when making a reservation.